"Our customers asked for high-capacity performance and solid reliability of the equipment they invest in, and the low temperature screw compressor condensing units deliver on both fronts." Heatcraft Worldwide Refrigeration, a leading provider of commercial and industrial refrigeration solutions, announces the release of their newest addition to their condensing unit product line, a low temperature screw compressor condensing unit. As a complement to the existing medium and high temperature options, the new low temperature addition fits well within the company’s goal of providing the commercial and industrial refrigeration market with a comprehensive offering for large cooling applications. Heatcraft Director of Cold Storage Sales, Grady McAdams, worked closely with the development team to communicate the need for a high-capacity condensing unit for low temperature applications in the cold storage market. The low temperature screw compressor condensing unit can be paired with Heatcraft’s current line of industrial unit coolers. These pairings will provide optimized split-system refrigeration for large, low temperature applications. The hallmark of the new low temperature unit is its robust construction, providing maximum reliability over the life of the unit. 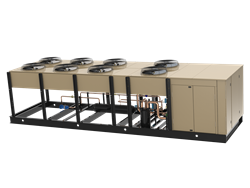 The higher-capacity single unit can replace the need for multiple condensing units for the same application, resulting in lower installation and maintenance costs. Additionally, standard components, such as screw compressors, welded frame, floating tube coils and a dedicated oil cooler provide robust, reliable performance.